The Skia Sweetspot trainer has been developed by a UK Doctor and keen skier, Mr Martin Breach with the help of director and founder of the BASS (British Alphine Ski & Snowboard School) Network, Hugh Monney. The Skia Sweetpot is best used on a smooth hard surface, so as not to damage the blocks. The boots are one size fits all and can be used all year round in the comfort of your own home. Great for pre skiing fitness and stability training. The Skia comes with four blocks for each Skia. Each block is a different width, with the widest being the easiest and the more narrow blocks being harder. All blocks are colour coded starting with green, blue, red and black representing beginner, intermediate, advanced and expert. Each block is attached to the underside of the trainer. What's the Sweetspot and where is it? On every ski there is a point in the middle which is market by an A. 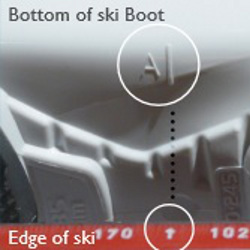 This indicates the sweetspot and the optimum point where to place the ski boot. Once you've placed the block on your ski boot you'll notice that the block lines up perfectly with the marked A. The Skia trainers will teach you to place pressure in the middle of your foot and not the ball of your foot which I had previously thought. Over time this should actually make skiing much easier, it will add less pressure on your legs and it'll be less tedious on your muscles. Whether you're a beginner or an expert, training and learning to balance with the Skia is a simpler, safer and more stable way to ski. Place the blocks on the underside of the trainer, once your ski boot is on your foot and begin with the first green block. Accompanied with the product is an indepth manual, wirtten by Hugh Monney, he talks about why centre balance is important when skiing and provides you with a number of drills to improve your skills on each block before moving on to the next one. Drills include centre balance sessions, movement in balance session and edging movements which will help with steering. Although the manual is in depth it is easier to follow by watching videos which you can find by visiting the Skia Sweetspot website. Here's an example of a training video. The trainers are relatively light and can be taken on holiday with you, use them as a morning warm up session or train with them and practice what you've learnt on the slopes. These trainers retail at £45.00 and are a great way to take your learning to a new level. We still suggest a pre fitness workout in the weeks leading up to your holiday but the Skia Trainers will help with balance and movement while staying centred we think a great way to taking training into your own hands.